To put that into context lets say you make something using €1.00 worth of materials, that's easy enough so far, you can simply divide the materials you buy into component parts to work out how much each part costs you and how many of each you use per product. What are your overheads? 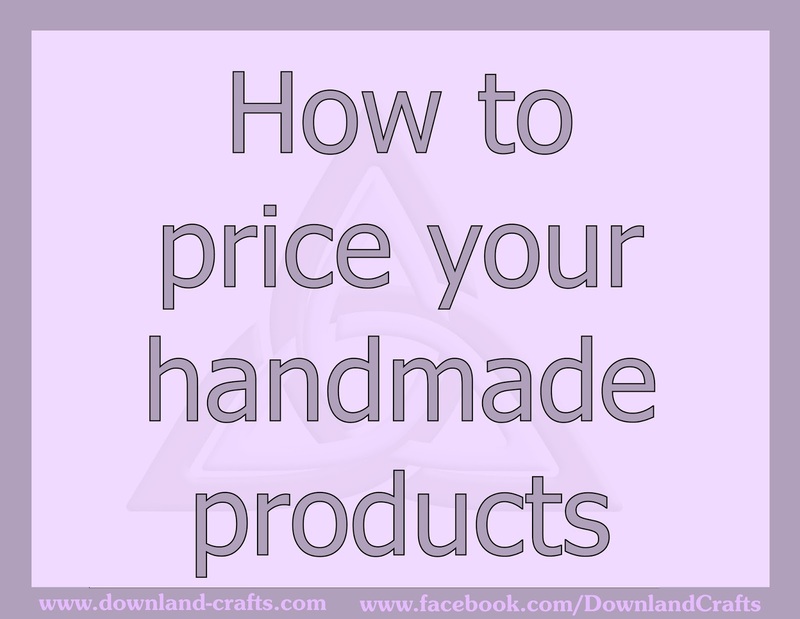 That can be lots of things including the time you spend sourcing those materials, money spent on websites and other outlets where you sell your crafts, perhaps you have an Etsy shop or do craft fairs, all these fees are costs on top of your materials. Now of course it's not easy to calculate how much to attribute to each item so an average of 10-15% would be considered normal. If we go by 15% that makes your total now €1.15 for materials and overheads. Your time is a big factor that you can't ignore, if you were doing an office job or working in a shop you would get an hourly rate that is still important now you work for yourself. There are other people that will tell you to base it on your experience, that to me causes another problem. Yes at the moment you will hopefully be confident enough to not consider yourself to be a novice any longer so let's say an intermediate crafter, what happens when you become an expert? You would need to increase your prices across the board. €10 per hour is perfectly acceptable and you are definitely worth it. Say your piece takes 30 minutes to make, your time cost is €5.00 + €1.15 for materials and overheads makes your total now €6.15. This figure is what is has cost you to make the item, you are yet to make any profit so if you sold it for cost price you would only break even and effectively be selling it for nothing. How much profit you make is a personal decision and I have seen everything from 10% to 100% suggested. 10% is not nearly enough to keep you afloat after all if you don't make any profit your business will fail. 100% is the minimum shops will be marking up your items should you decide to sell to them on a trade/wholesale basis, they of course have their own overheads to pay for so it's not as greedy as it sounds. You could go as low as 70% but why should you be making less than the people you are supplying? After all it's your expertise and creativeness that has produced your product. So, your cost price is €6.15 x 2 to allow for profit means your total is now €12.30 for your trade or wholesale price. Finally take your trade/wholesale price and times it by 2 to get your retail or selling price. The final price for your item is €24.60. There is one other price point to think of when selling to shops on a sale or return commission basis rather than on a trade basis as above but we will go into this in more detail at a later date, for now this formula will keep you on the right track. Once you use this formula on your own makes you will see how your prices sit alongside your competitors with your target customers. Now I would be very surprised if at least one person reading this post, if not a few are thinking this woman is nuts, there is no way I can charge that! Before you dismiss the formula consider what you are trying to do and where you want your business to go in the future. I have often seen suggestions such as take the cost of your materials and times by 3 for your selling price. This may work to self fund a hobby but will not sustain a profitable business as it doesn't take into account your time or overheads incurred while running your business. Even worse is when they ask people's opinion on 'what do you think this is worth?' or 'how much would you pay for this?' My advice would be to make friends with a spreadsheet where you can input your formula and keep your pricing structure consistent. It's also much easier to simply input the cost of your materials to get the final figures than it is to work out prices for each individual piece manually. 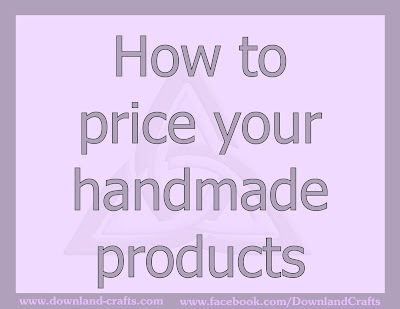 Sadly not every craft is suitable for turning into a business, some labour intensive products would work out far too expensive to sell competitively unless you can either reduce the price of your materials or your time spent making it. There is nothing wrong with still crafting these pieces for fun....I certainly do! In our next instalment we will be focusing on keeping records for your business, how to set up spreadsheets and the paperwork you need to have for your accounts. Thanks Trish. It is very difficult to price something we really enjoy to do. Superb advice.. I must read it a few times & share it... Thank you! :-! Downland Crafts. Watermark theme. Powered by Blogger.